Johnson City's growth was transformed through development of transportation in East Tennessee. Trails first blazed by migrating buffalo and Native Americans evolved into trails for stagecoaches, tracks for rail lines, and paved roads for automobiles. Henry Johnson realized the potential for the area and took a risk in 1854 when he bought a parcel from Abraham Jobe at the junction of the proposed East Tennessee & Virginia Railroad and the stage road to build a home, store, and depot. The community that arose around this complex was known by many names in its early days, including Blue Plum, Haynesville, and Johnson's Depot. However, on December 1, 1869, Johnson City received its first charter of incorporation from the State of Tennessee. 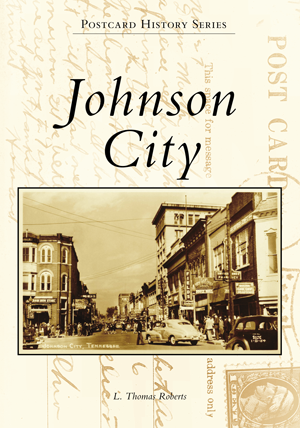 As Johnson City approaches the 2019 sesquicentennial of the city's incorporation, this collection of postcards provides a look back at the people, places, and scenery around Johnson City. L. Thomas Roberts grew up in Johnson City and attended University School and Science Hill High School. Roberts lives in Florida with his wife and children but often returns home to visit.